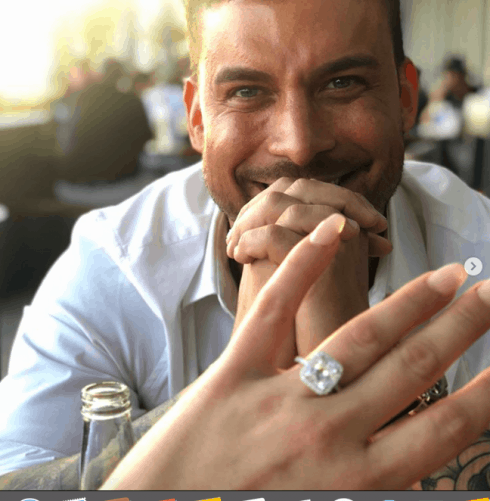 The season Seven premiere of Vanderpump Rules airs tonight on Bravo and features Jax Taylor’s romantic proposal to Brittany Cartwright after a bit of a bumpy road. The ring he gives Brittany has an extra-special sentimental significance. Jax’s father recently passed away, and his death sent Jax into a bit of a tailspin. Brittany was there to help him cope with the loss and prevent his life from spiraling downward. His engagement ring for Brittany holds meaning that connects their engagement to his father’s remembrance and how Brittany was there for him when he died. Tonight’s episode documents Jax telling his friends about his plans to propose, and the actual proposal itself which actually took place this June. Vanderpump Rules airs at 10 p.m. Eastern on Bravo.